This month I was asked which character I seek out in the parks, and I immediately thought, "oh no! I'm going to have to find someone to write for me because I don't seek out characters!" Then I realized that was kind of a lie... I prefer to happen upon characters, but sometimes being with whoever I'm with causes me to go look for characters, or I'm in a face my fear kind of mood that day. What? Face your fears?! Yes, non-face characters (ones that don't talk and have a headpiece) scare me a little. I just turned 30, and I still have a tendency to wave at characters, take guest-less photos of them, and head the opposite directions. Over the years, though, I have learned to fight this fear, so let me share some of my favorite characters to find. 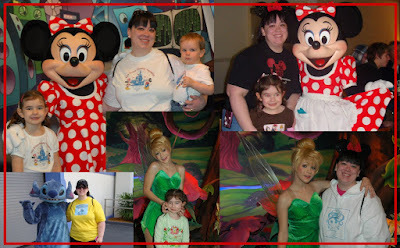 On that trip I also met Stitch (horrible photo not shown - better one there is my redo May 2009) and Tinker Bell who quickly became my favorite character to meet because you never know what she'll say! Meeting her with other fairies present is one of the best experiences because they banter with each other and guests the entire time! They're awesome! Between our 2009 and 2010 trips, I read a blog post about getting good photos with the characters and how if you ask them to pose with you, as long as it's in their character's nature to do that pose, they will. I went on our family trip in 2010 determined to face my fear and get a really good pic of me and Stitch surfing together. I also have one somewhere of the Red Queen and myself, but I can't find it right now. Having a plan to meet the characters made me shake much less! On my cruise this last November I had no intentions of meeting the characters, but Tink had a tiny line after dinner one night, and I so love meeting her, so my mom joined me in grabbing a quick photo. I think the secret to the best experiences with characters is to interact with them. Talk to them if they talk, pretend you're a princess or a fairy too, go with the flow. If your child is like me and scared of meeting characters, talk to them before your trip about ideas for poses with the characters. "You love Belle - how about pretending to read a book with her?" Having an idea to focus on helps take the focus off of the fear. I have a surfing pic with Stitch too and it's fantastic... unfortunately it's hard-copy only :P But I am glad you face your fears! My favourite character to meet has turned out to be Goofy, even though I rarely seek him out. But he's always SO funny - plus in all my photos I look ridiculously happy to see him, lol! My kids LOVE getting their pictures with the characters, which was not always the case. We love Minnie, but Hayley absolutely loves Stitch! We can't leave with pictures with at least those two! Love the picture of you with Stitch - very cute!